Industrial and professional black plastic spray bottles for cleaning and gardening solutions. Included spray trigger nozzles are chemical resistant to stand up to harsh conditions. 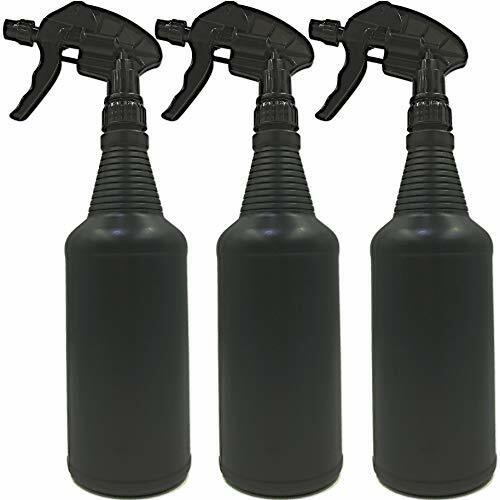 Multi-pack of three (3) 32 ounce empty, black spray bottles with chemical resistant trigger sprayer nozzles. Perfect for household cleaners using essential oils, commercial and industrial use, auto detailing, beauty, pets, pest control and gardening. ***Save time and money with this multipack! *** 1) Please always store in an upright position! 2) If using bleach, or other caustic substances, avoid storing solution in bottle. Rinse after each use to prolong trigger life. UV BLOCKING for Industrial Gardening, Commercial Cleaning, Janitorial, Auto Detailing, Household Cleaning, Beauty, Pets and More! PLEASE ALWAYS STORE YOUR BOTTLE IN AN UPRIGHT POSITION!!! If you have any questions about this product by S & E Packaging, contact us by completing and submitting the form below. If you are looking for a specif part number, please include it with your message.